Super Savings Item! 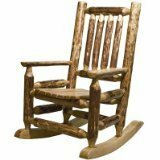 Save 40% on the Montana Woodworks Glacier Country Collection Children's Log Rocker by Montana Woodworks at Indsight. MPN: MWGCKRS. Hurry! Limited time offer. Offer valid only while supplies last. This lovely children's rocker features the famous ''Glacier Country'' collection finish so reminiscent of the ''Grand Lodges of the Rockies'' circa 1900. This lovely children's rocker features the famous "Glacier Country" collection finish so reminiscent of the "Grand Lodges of the Rockies" circa 1900. Multiple coats of premium grade stain and lacquer are professionally applied for a finish that is durable, long lasting and beautiful. Comes fully assembled. Ergonomic design. 20-year limited warranty from manufacturer included. Weight capacity 350 pounds. Made in the USA by Montana Woodworks, a One Good World verified Eco-Friendly company. If you have any questions about this product by Montana Woodworks, contact us by completing and submitting the form below. If you are looking for a specif part number, please include it with your message.